Culinary trends begin with chefs and restaurants serving inspired dishes to help people fall in love with new ways to enjoy their favorite meals. As a cultural island favorite, SPAM® Musubi is the latest to begin appearing on menus across the country, and is now poised to win the hearts of the mainland. 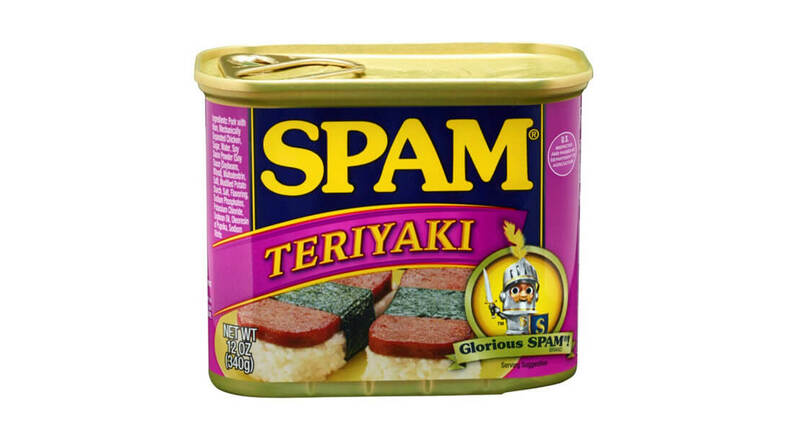 Long-time brand fans, culinary trend-setters and Hawaiian natives Aloha Plate are joining the makers of the SPAM® brand family to announce the national availability of the new SPAM® Teriyaki flavor, and ride the wave of Musubi as it makes its way into the national lexicon. SPAM® Teriyaki is inspired by the rising popularity of Asian and Island cuisine within the food community, and as Champions of the Food Network’s The Great Food Truck Race, Season Four, Aloha Plate has made it their goal to bring cuisine from Hawaii and the celebratory culture of aloha to the mainland. Chef Adam Tabura, Lanai Tabura and Shawn Felipe even earned the show’s SPAM® challenge trophy for their Sweet Ginger Soy SPAM® Sandwich with Volcanic Aioli, and want to continue making fans of all who taste their creations. With an emphasis on the introduction of SPAM® Teriyaki, Aloha Plate will bring Musubi- a slice of fried SPAM® Teriyaki and rice wrapped in nori (seaweed) – to the masses, developing flavorful, on-trend recipes that will be sold and sampled out of the Aloha Plate Food Truck at event appearances, while encouraging everyone to share the unique ways they Musubi to the online conversation. As a staple in Hawaiian kitchens- local consume more than 7 million cans of SPAM® products each year, the combination of SPAM® Classic and the distinctly sweet and savory flavor of teriyaki make for a perfect Musubi. The partnership aligns more broadly with the brand premise of encouraging consumers to expand upon their favorite SPAM® recipes by adding a creative twist to mealtime- or to Break the Monotony™. Aloha Plate will develop and share unique Musubi recipes via sponsorship of the Cooking Hawaiian Style show, provide samples and experiential marketing at popular food and music festivals, including Coachella in April and the Waikiki SPAM JAM® Festival in May, and engage with fans through social media. SPAM® Teriyaki is available in supermarkets nationwide and as with all SPAM® products; the suggested retail price for a 12-ounce can is $2.96. With this introduction, the SPAM® family of products now offers 12 different varieties in the U.S., including recent additions of chorizo and jalapeño. Continuing to expand on the global brand, an exciting new flavor- SPAM® Tocino is now exclusively available in the Philippine market. Traditionally served with rice and eggs, Tocino is a sweetened cured pork dish with Spanish influence and will also be available for purchase on SPAM.com. For more information, please join the conversation at https://www.facebook.com/spambrand, http://www.youtube.com/spambrand or https://twitter.com/#!/SPAMbrand. For more information on Aloha Plate, please visit http://www.alohaplate.com and Cooking Hawaiian Style at http://cookinghawaiianstyle.com. Hormel Foods Introduces Industry-First Shelf-Stable Egg with new Hormel® Compleats™ Breakfast Hormel® Compleats™ breakfast are an ideal solution for Americans who are increasingly forced to choose between conflicting priorities. Hormel Foods Energizes the Protein-Based Snack Category with the Launch of Hormel® REV® Wraps Hormel Foods introduces Hormel® REV® wraps; a protein-rich snack providing sustained, real energy to keep teens fueled longer.